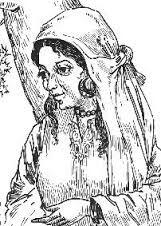 Born around 1554 in the small village of Chandrahar in India, Habba Khatoon is remembered as one of the great mystic poets of her era and was called Zooni (translated as the moon) because of her great beauty. She is considered one of the great influences on Kashmiri culture and her songs and poetry are still popular within the region today. Unlike many of her friends and family, Khatoon was unusual in that she learned to read from an early age, primarily with the help of a local moulvi or Muslim doctor of law. Her attraction to poetry caused friction amongst her family, especially when she married and her sister in law and mother in law both tried to bully her into a ‘normal’ life. This led to the marriage breaking down and ultimate divorce with Khatoon being returned to her parents. From the very beginning, Khatoon rebelled against the poetic norms of the day that many of her male counterparts adhered to. Most of the poetry written at this time was spiritual and often suffocating in its concentration on the individual rather than society as a whole. What Khatoon tried to do was put down her true thoughts and feelings and her verse is often seen as a mixture of sweetness and enduring pathos that many found reached them on a personal level. Another factor in her success was also the fact that she was from a peasant family but began to rise in standing, particularly when she came to marry the last king of the Kashmiri region, Yousuf Shah Chak. When he was forced to flee by the invading Moghal king, Khatoon went with him, spreading her poetry and songs as she traveled, ensuring that they would survive through word of mouth for centuries to come. The historical accuracy of her life has often been doubted over the years and there are some reservations about the number of songs that are actually attributable to her. Some historians have said that Khatoon came to the attention of Yousuf Shah Chak and he was so impressed by her poetry that he admitted her into his harem but did not marry her. According to literary scholar Shri Amin Kamil only twenty songs can be truly attributed to Habba Khatoon but Kashmiris have attached her name to many poems over the years and these have been printed in great numbers. The two main influences on her poetry have been the failure of her first marriage and her relationship with Yousuf Shah Chak, particularly the period when he was sent away in exile to Bihar. Her songs talk of earthly love and are more pragmatic in tone and less spiritual than those of her peers at this time in the sixteenth century. Her candidness and lack of compromise was considered different for the time and she was, at some point, given the name of the ‘nightingale’ of Kashmir. Many of her songs were about the sorrow of separation and had a new lyric quality and live on to this day. There is debate over when Khatoon actually died but it is thought to have been around 1609 when she would have been in her late fifties.